FA1301 COST Action Working Group 2 (Stress and Diseases) will join the 17th International Conference on Diseases of Fish and Shellfish. The EAFP Conference will be held in Alfredo Krauss Auditorium in Las Palmas de Gran Canaria, from 7 to 11 September 2015. The participation of members of FA1301 COST Action to the EAFP2015 Conference will i. facilitate networking between FA1301 ‘science’ and compatible/complementary scientific endeavors, ii. allow beneficial interaction with other aspects of compatible disciplines and research done in other taxa, iii. extend the potential of research efforts on biology and welfare of cephalopods. Organized by the European Association of Fish Pathologists, EAFP conference is a key event for the scientific community working on topics related with pathologies affecting the main marine animal taxa. Selected members of the FA1301 WG2 will convene, together with representatives of other CephsInAction Working Groups (WG1, WG4, WG5), and contribute to the EAFP2015 main program with a dedicated symposium (September 10). Posters presentations will be also delivered during the main EAFP2015 Program. 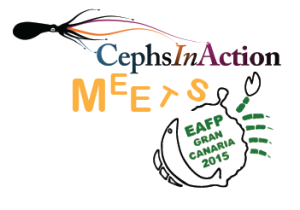 WG2 CephsInAction meets EAFP2015 will synthesize and analyze the available knowledge on cephalopod biology and physiology in relation to animal welfare. Discuss about evaluating the environmental, biological and behavioral needs of different cephalopod species to increase success of caring, maintenance growth and rearing . This with the ultimate goal to reduce stress and increase welfare in laboratory-research and aquaculture establishments. Increase the knowledge of biological and physiological indicators (e.g. biomarkers) of welfare for cephalopods, also by increasing the use of alternatives to live animals in research, and the use of non-invasive approaches. Increase of knowledge and identification of pathogens, mechanical damages, signs of stress and diseases in cephalopods. Study of the trophic relationship for cephalopods, with special attention to the transmission of parasites, thus allowing evaluation of animals well-being and ecosystem health. Focus will be also given to i. the development and sharing of protocols for assessment of health status of cephalopods, thus providing guidance for researchers, veterinarians and regulators; ii. contribute to the development of noninvasive/automated techniques for assessing physiological status of cephalopods; iii. the development of online databases as guidance and inventory of alternatives. During the meeting discussions will be also facilitated to achieve a better Coordination of Nationally Funded Research Efforts, in compliance with the the aims of the COST Actions, and to coordinate a series of multi-author publications that will help to disseminate the current achievements of the FA1301 community.